Yesterday my friend Sandie and I drove out to a quaint little town outside of Scottsdale called Cave Creek. It is the ultimate western town and is about a half hour drive North for me. Our destination was The Town Dump. (No, not that dump!) This dump!!! 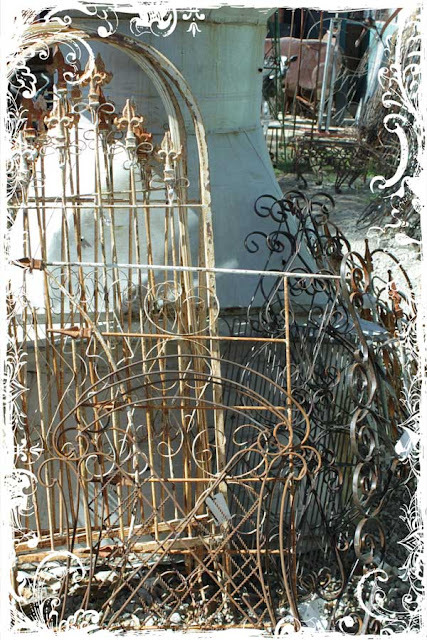 It is full of the most wonderful wrought iron pieces for the garden or even inside. 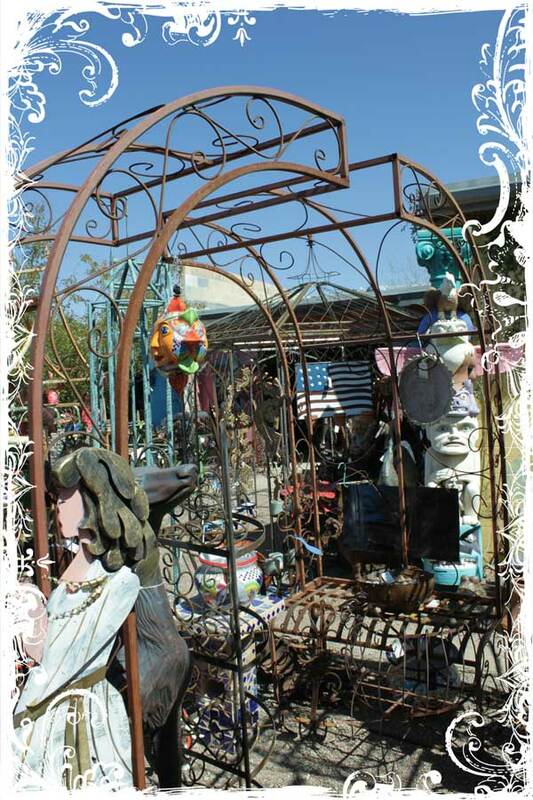 Don't you love this arbor??? 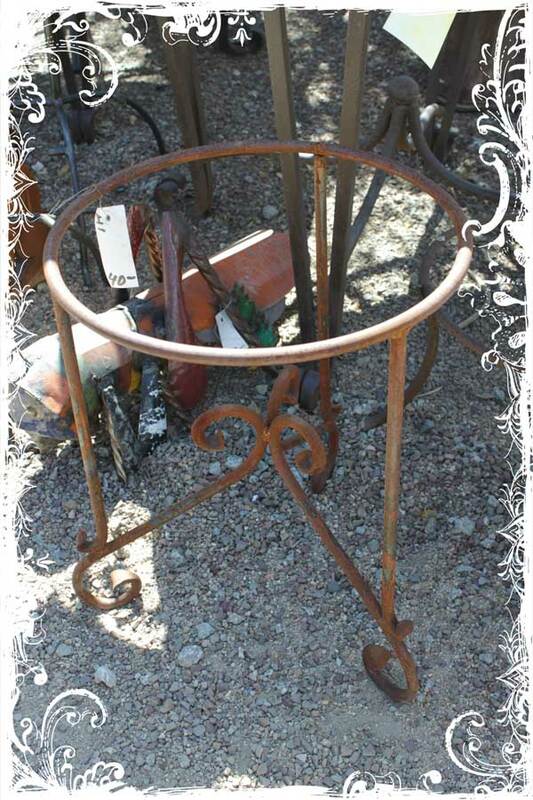 There are table bases and plant stands everywhere, already rusty and aged. Just the way we gals like them!!! This small table base was only $40.00!!! 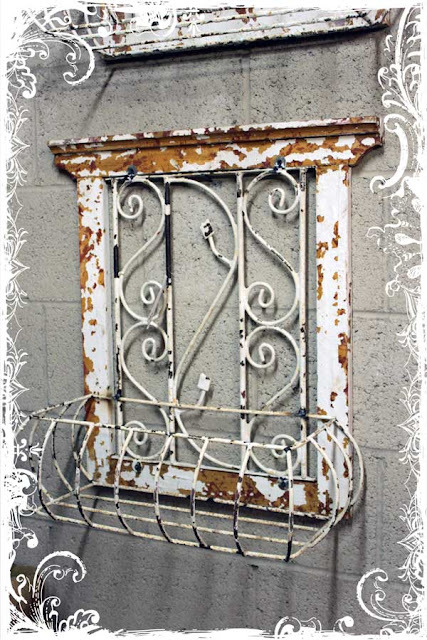 Some of my favorite things are all the rusty white fence panels they have. The one in front of my fireplace came from here. I thought this was a great piece. Now you have to keep in mind, that is not the wonderful architectural salvage that you girls have in other parts of the country. This stuff is made in Mexico, but when it's hard to find the real thing, some of this stuff doesn't make a bad compromise. They really have a lot of other very funky things. 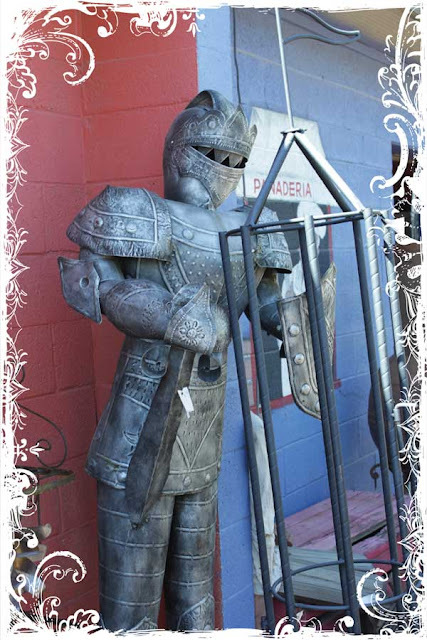 Most of them VERY southwest, which I don't care for, but how about a suit of armor??? Sandie and I had a great time, as we do every where we go. You are the most lovely flower I have ever seen on a cactus!!!! And speaking of of lovely things...I got the sweetest email from Sallianne, who said she featured me on her blog Single Successful You. It's a blog about independent (singular!) ladies who are thinking about or who have started a business solo! I think she was very nice to have featured me on her blog so maybe you all could go over and say hi!! I will have to arrive at the Bloggers Tea early on the 26th to swing by this shop. what a fun field trip! it looked like a beautiful, sunny day- blue skies - i'm soaking it in vicariously! the town dump looks like a winner to me! 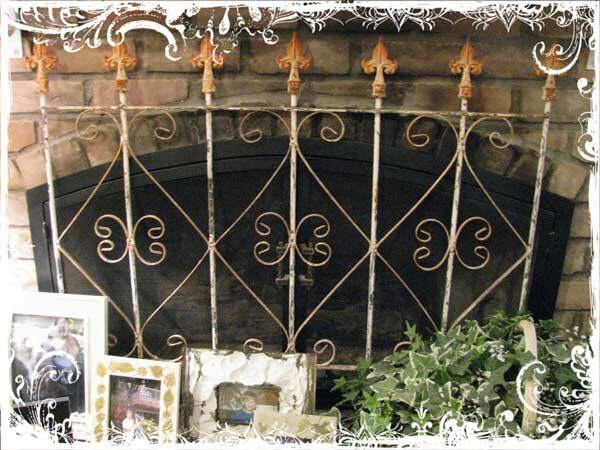 i have that same wrought iron piece in front of my fireplace in my studio. i've drapped white lights around it and hung a vintage dress over it. so cute! im on my way-i wish! This is another place I could spend at least half a day in, Karen! What great stuff! Wow, what a fun day trip... great place!! 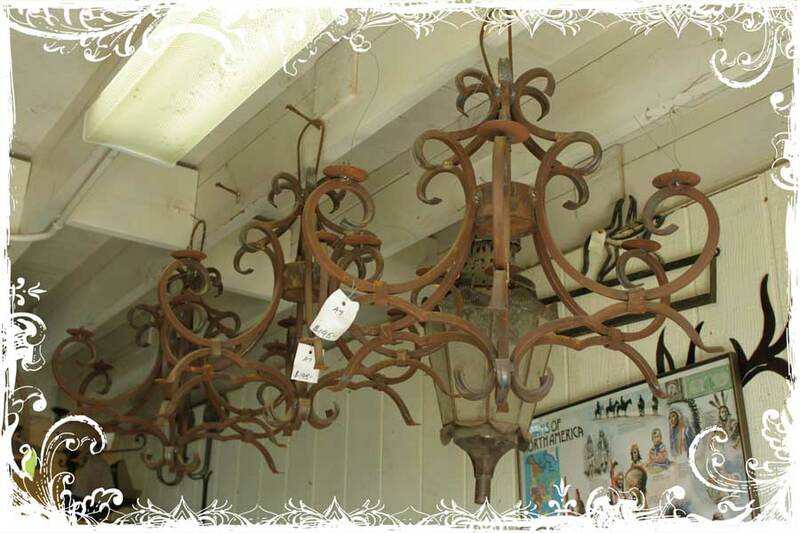 These places are great for finding that rusted patina. I always stop in them when in El Paso. you never know what you will stumble upon. I love the "Town Dump"! I discovered it when I was visting my sisters who live in the Phoenix area! So many cool finds! Thanks for sharing it with us! Wish I could get back there soon! Have a wonderful day! Love your Town Dump. Makes me want to go out junkin today! Ooooooh, Karen, all I can say is "WOW"!!! I'd love to drive over and visit when we're down So. Calif. this summer. My tongue is definitely hanging out, sugar!!!!! J'adore les brocanteries, tes photos sont super! Good weekend et hello from spain. 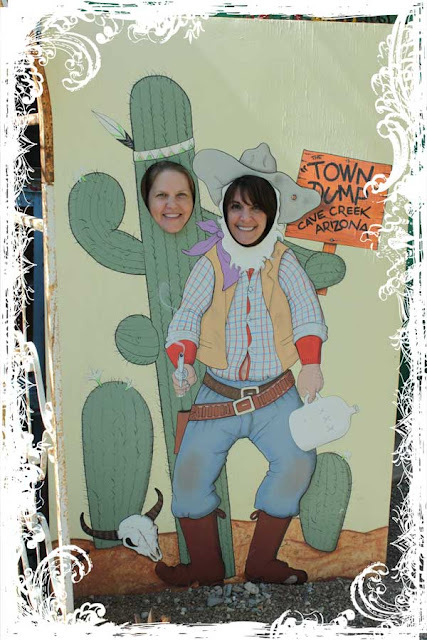 Hi Karen, I love, love, love Cave Creek! 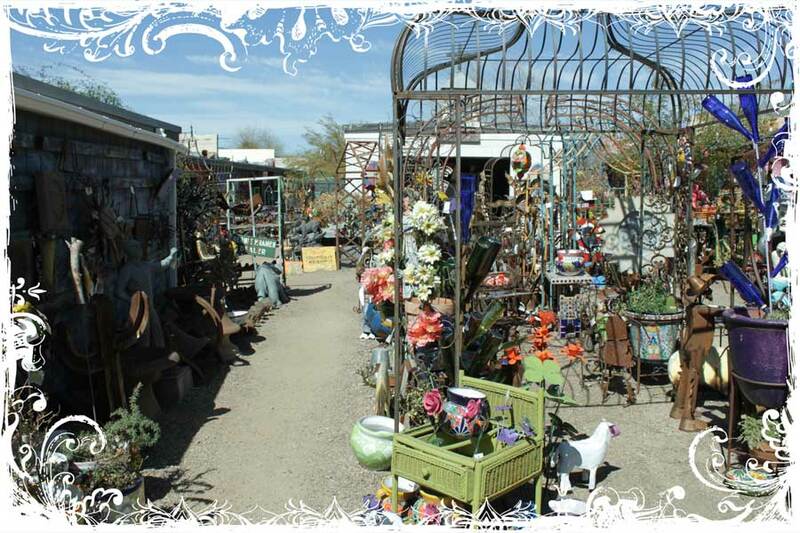 Went there on a romantic weekend with hubby there a few years ago before moving to AZ. Thanks for posting this....I haven't been there for a while and I know I would absolutely love that place!!!! I'm into southwest decor about as much as you love the romantic cottage style. Glad that two different styles can be found at a place like this. What a fun adventure! Look like some great treasures to me. Have a great weekend! Looks like a wonderful place to visit. I particularly love the fencing with the fleur-de-lis at the top. I love this place! My husband and I sometimes just get in the car and drive all the way out there just to nose around (from Gilbert). We'll spend hours going through all the little rooms and then head out to one of the local restaurants for lunch. After lunch we'll usually head over to Kierland Commons for a few hours of perusing the stores. It's always a lovely day when we do that. Thanks for reminding me! See you in April. What a fun place to spend some time browsing and shopping of course. I love the pieces of iron fence. I love places like this! 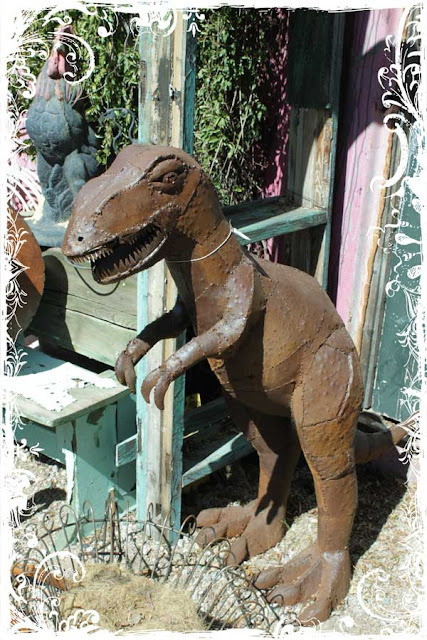 We have them here on the east coast and when they are original rusty pieces they can be so darned expensive... I say what ever works. Great you found this place and shared it with us! I lived in New River, near Cave Creek many years ago. Shopping in Cave Creek was always fun. If I ever get back over that way, I will check out The Dump. I like what you found. 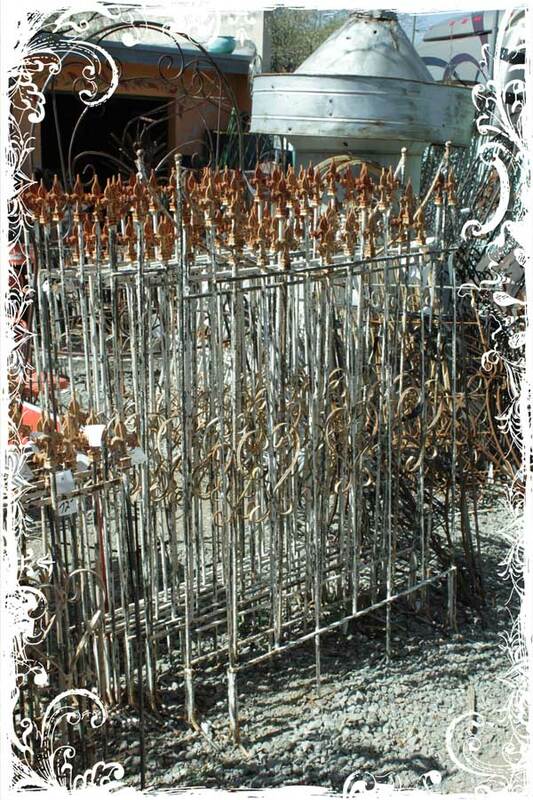 Oh I just love it, here in france they call wrought iron 'fer forge' and is it so, so expensive. I wish I could pick a couple of those fabulous pieces up and magic them over here. I love your blog and love your style. 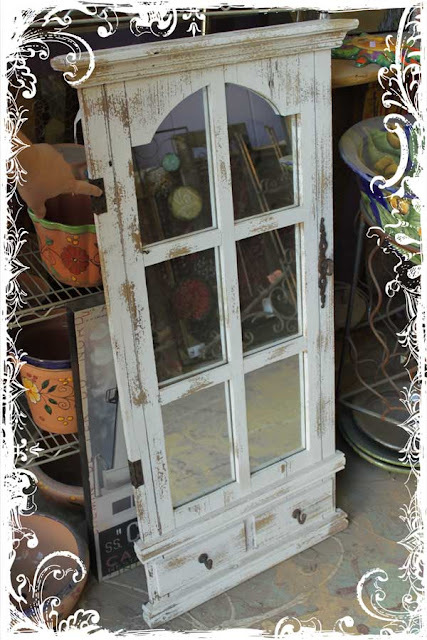 oh I wish I had something similar close by...I need an arbor just like that! This is a must visit place when you go to Cave Creek! I found a cow skull for my front porch there. Put a vintage dark pink corsage on it's forehead and tied some jute around it in a bow! Perfect! Glad you had a good time. I need to make another trip up there soon! Love all the worn fencing and other shabby iron work! Thanks for sharing! BTW, have a great time in Texas!!! Lucky you! I would need a semi truck and trailer in order to get back here with all the stuff I bought! And a BIG bank account to cover it all! LOL!! Love these fabulous photos Karen - I would lose my mind in a wonderful place like that! Perfect treasures for our flower gardens - love all of the things you found! That's a NICE town dump! I love flea markets! Aren't they the best! I can not wait for the weather to start getting warm so I can go pickin'!